If you have, you’re right. In fact, commercial facilities use nearly 19 percent of ALL the energy used in the US to run their buildings (4). Consider the HVAC system in your building. In 2017, the US Energy Information Administration (EIA) noted that HVAC systems would represent 30 percent of a commercial building’s energy consumption (1). 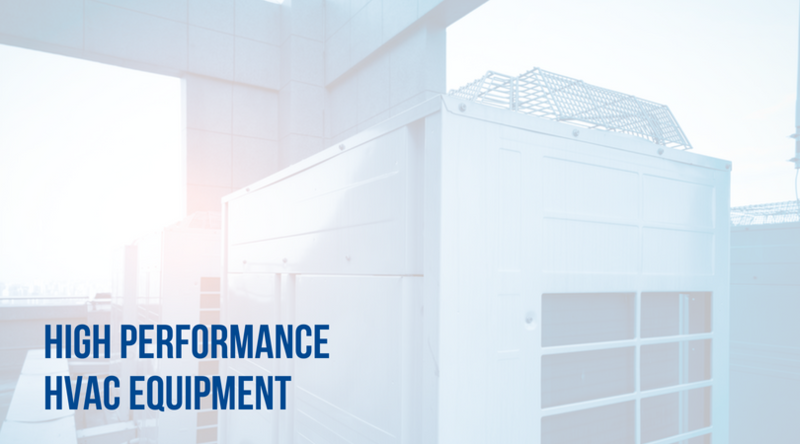 HVACs tend to use the most energy in the building, so with that in mind, it’s a good idea to look into high performance HVAC equipment. Let’s dig deeper. Just as it sounds, high performance HVACs/HVAC equipment run as efficiently as possible. This can be a tough to balance considering HVACs represent three different functions: heating, ventilation and air-conditioning. As you know, one function could counteract the other, defeating the efficiency of other parts of the system (3). But, luckily, today’s innovative equipment can minimize energy consumption and maximize energy efficiency. The result: you can reduce HVAC’s energy consumption and save as much as 20 percent on energy costs (2). If this sounds like something your company needs, here are some fundamentals for when it comes to energy and resource-efficient HVAC design and install. If you want an HVAC system that runs well, you—with our help—have to note each aspect of your building (3). Do you have windows that allow air to come through? Do you have machines running that make certain rooms warmer? Does the company incorporate daylighting to save on energy costs? These are all factors that need to be noted in order to create a high performance HVAC system, among many others. Bigger isn’t always better. An HVAC that’s too large for your business can actually increase your costs because it won’t run efficiently (6). But a small system could also run into problems because it has to work that much harder to do the job (6). By following the other fundamental concept of looking at building aspects, this can help determine your best option. Most fully-loaded HVAC systems run at peak efficiency, but most systems are already made bigger on purpose to handle loads that only happen 1 to 2.5 percent of the time and for safety reasons (3). When most systems run at half of their capacity or less, part-load equipment may be a good option. Our natural environment can be a great resource for your HVAC system, and it’s free. You can use a process called waterside economizer, as just one example, to make cold water in cooling towers when the weather allows it, which gives you chilled water without using compressors (5). And, depending on where you live, you can use another process called airside economizer that uses the outside air to cool supply air (5). If you know there’s a possibility for expansion in the future, make the steps to prepare for it by using modular equipment and sizing the mechanical room space well (3). The name of the game is typically minimizing energy consumption where you can! Take advantage of off-peak hours from electrical utility companies by running your HVAC system during those hours (3). This is normally at night, which is also a great time to run chillers since the temperatures are cooler (3). That way you can avoid more expensive rates at peak hours and the warmer temperatures during the day. You never know when a building design can shoot up your costs. If you think that might be the case, contact us to get the best recommendations on what changes need to be made. By including all aspects of building designs at once, you can reduce loading costs and it can be the difference between spending a little or a lot (3). No list would be complete without knowing how your AC fits into the big picture. Without chillers or condensers, there’s no way of keeping your space cool and essentially, controlling the temperature of your building (3). The right air conditioning equipment is a must for energy-efficient design. Ventilation allows you to have conditioned air in your work space (3). Whether your building needs 100 percent ventilated air or a Variable Air Volume (VAV) system for your air, it’s important that your business has some type of ventilation system. When it comes to your HVAC system, you should never settle for less than optimal. At Greater Comfort Heating & Air Conditioning, we’re here to help you take your HVAC system to the next level. We can do anything from instal to repair to system maintenance. We want you to have a heating and cooling systems that runs at the highest performance possible for your business. Give us a call at 859-491-4915 or contact us online today.